DUMBARTON deserved a point from a hard fought tussle against Ladbrokes Championship leaders Hibs at the Cheaper Insurance Direct Stadium. DUMBARTON deserved a point from a hard fought tussle against Ladbrokes Championship leaders Hibs in front of a 1,339 crowd on a sunny day at the Cheaper Insurance Direct Stadium. Neil Lenon's side won the game with a hotly disputed penalty in the first half, with Jason Cummings netting expertly from the spot. It was just one of a succession of decisions by referee Greg Aitken and his assistants, David McGeachie and Mark McHendry, which infuriated the home crowd. While consistency is what is wanted from officials, this trio consistently gave 50:50 decisions to the 'big team', repeatedly failed to penalise time wasting by keeper Marciano, and frequently ignored the visitors stealing yards at throw-ins and free kicks. While Hibs were the better team, the battling home side more than earned a share of the points. 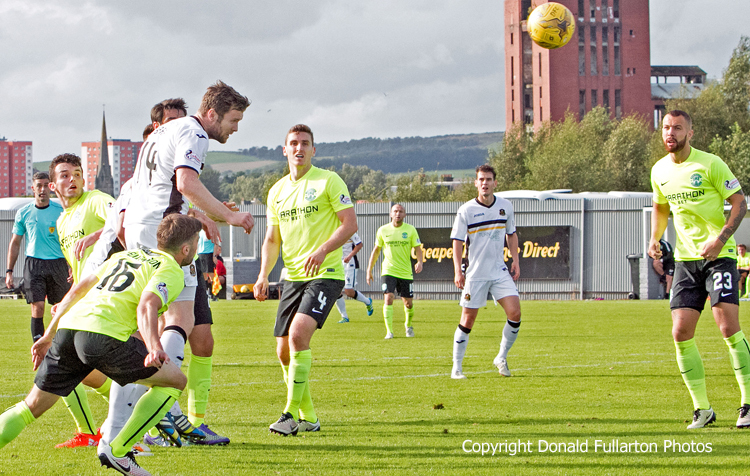 The game was even for the first half hour, with both sides having chances and Sons doing well to contain Hibs attacks. Then on 31 minutes referee Aitken changed the course of the game when he gave what appeared to be a soft spot-kick for an infringement by Gregor Buchanan on Grant Holt. Dumbarton reeled from that blow, but quickly recovered their discipline and started well again after the break. Neither side looked like adding to the score in a tight second half, but Sons could almost have stolen an equaliser right at the end, when Darren Barr headed just past the near post (pictured). In the end Hibs hung on to their lead and to their position as league leaders, while Dumbarton slip to sixth place on four points from five games. Garry Fleming's appearance as a second half sub was his 150th outing in a Sons shirt.